There is a canopy bed style to suit any room. Designs can not only bring instant romance to a room, they can create a dramatic focal point, and make a little girl feel like a princess. When decorating this way, there are a multitude of options and ideas available. 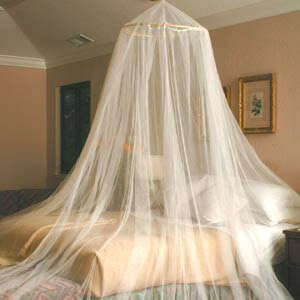 Simple mosquito net canopy- this style of canopy is hung from a single hook on the ceiling to cover the entire bed. Plain in style, but can be embellished according to the room's decor. A simple option that suits most rooms. Hoop canopy (princess canopy)- An easy option to make yourself (see below), but widely available in stores. The advantage of this option is that it adds romance to a room by just adding a canopy to the upper section of the bed, rather than the whole bed. Single rod canopy- This is an easy decorating idea, using a curtain rod fixed to the ceiling, down the centre line of the bed. 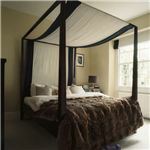 A triangle shaped canopy bed is then created by a large piece of fabric draped over the rod, hanging over either side of the bed. Multi rod canopy- Using the same principle as the single rod canopy, this time one rod across each end of the bed. 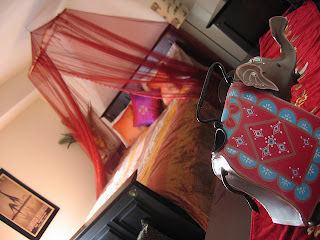 The curtain canopy is then created by the fabric being draped above the bed close to the ceiling, and down each end. This creates a nice "roof" and drape at the ends of the bed, leaving the sides open and easy access to the bed. Frame canopy - A lightweight rectangular frame is created from wood with fabric around each side to either cover all four sides of the bed, or as a cover to the upper section of the bed only. 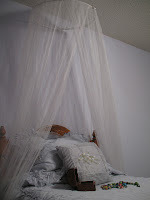 Bed frame canopy - Usually built into the bed, but is easy enough to create yourself. Four posts at each corner of the bed are then joined by a framework running between the top of each post. The modern way to hang the fabric is pictured here. Whilst most of the styles of canopy bed curtains detailed above are easy enough to make, in this section we will focus on the idea of making a simple hoop canopy (or princess canopy bed). 1. Cut through the hula hoop in one place, creating a space where the fabric can later be threaded on to. Stick a magnet on each side of the cut. 2. Spray paint the hoop silver, or a color of your choice to match the room's decor. Allow the paint to dry. 3. Measure the distance from the ceiling to where you want your canopy to end (floor or edge of bed). Add 15in for hems, and room for draping. This is the length of fabric you will need. Measure the circumference of the hoop (distance around), and times by 2.5 for the width of fabric you will need. It is entirely possible that you will need to stitch two lengths of fabric together to get the desired width. 4. Cut out fabric and hem the sides, with a small hem. Create double hems at the top and bottom of the fabric, ensuring you make the hem big enough to fit round the hoop. 5. Thread the top hem onto the hoop, right around until you meet the other side. Snap together with the magnets, and spread the gathers evenly. 6. Hang from the ceiling using cup hooks or curtain brackets, ensuring that the section where the two ends meet is front and center, allowing the canopy fabric to drape on either side of the bed. Canopy bed curtains need not be limited to floaty fabric though. If you want to use a more luxurious, heavy fabric, for a medieval style bedroom for example, then you can substitute a metal hoop for the hula hoop to take the extra weight, using curtain rod brackets to hang it from the ceiling. Once your canopy curtains have been made, there are many decorating ideas for canopy beds you can use to suit you and your existing decor, bringing a sense of romance and majesty to any bedroom - sweet dreams. Just found this blog today. Love it! 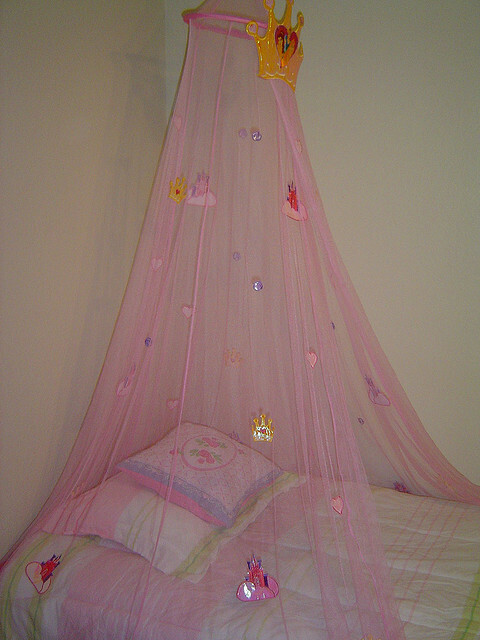 I have wanted to make a princess canopy for my little princess, but never thought of using a hula hoop! Thanks for the tips. Keep up the good work!